Congregation Tifereth Israel Town and Village Synagogue located at 334 East 14th Street in Manhattan. Image Credit: LPC. Before serving as a synagogue, 1869 building was home to German Baptist congregation and a Ukrainian Orthodox church. 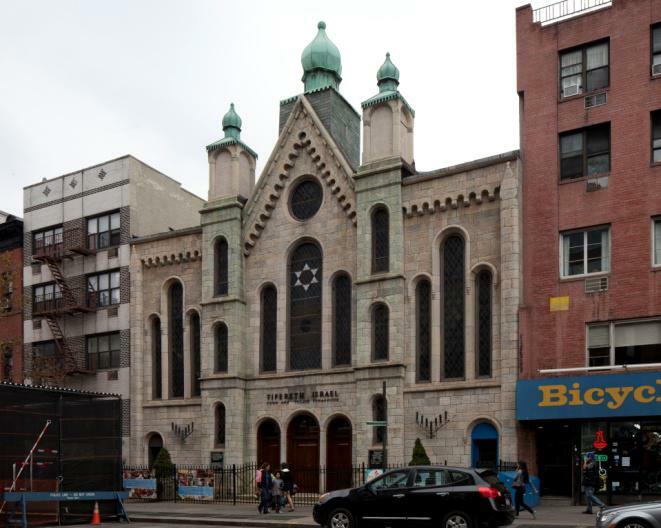 On March 25, 2014, the Landmarks Preservation Commission held a hearing on the proposed individual landmark designation of the Congregation Tifereth Israel Town and Village Synagogue located at 334 East 14th Street in Manhattan. The structure was completed in 1869 to designs by the German-born architect Julius Boekell. The Runbogenstil style structure was originally built as the First German Baptist Church to serve German immigrants who populated the Lower East Side. In 1926, the building was sold, and converted to the Ukrainian Autocephalic Orthodox Church of St. Voldomyr. The new congregation replaced the crosses on top of the church’s spires with onion domes, which remain today. In 1962, the building was sold to the Town and Village Synagogue by Congregation Tifereth Israel, which currently retains ownership. The church remains substantially intact, but it has undergone some alterations. In addition to the replacement of the crosses, the doors have been replaced and one of the original stained-glass windows has been lost. Landmarks Chair Robert B. Tierney read into the record a joint letter from Council Member Rosie Mendez and State Senator Brad Hoylman, who support the designation, but urge the exclusion of the rear structure from the landmark site. Tierney closed the hearing for the day, but left the record open for 30 days to allow the submission of additional testimony. LPC: Congregation Tifereth Israel Town and Village Synagogue, 334 East 14th Street, Manhattan (LP-2457) (March 25, 2014).